One of the problems of Solo gaming is having to keep track of too much stuff and forgetting what's going on. 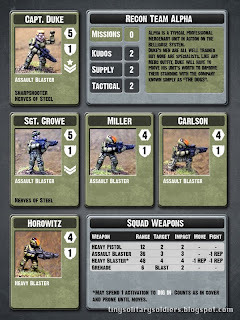 I've always wanted to make squad roster and quick reference cards to help make this simpler. Problem is they take up a lot of space and I want to be as minimal as possible. 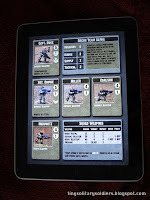 I've settled on the excellent (and free) ruleset "Chain Reaction 3.0" by Two Hour Wargames. For me it's the right mix of detail and abstraction, speed, and unpredictability. Plus it plays better solo without further house rules than almost anything I can think of. 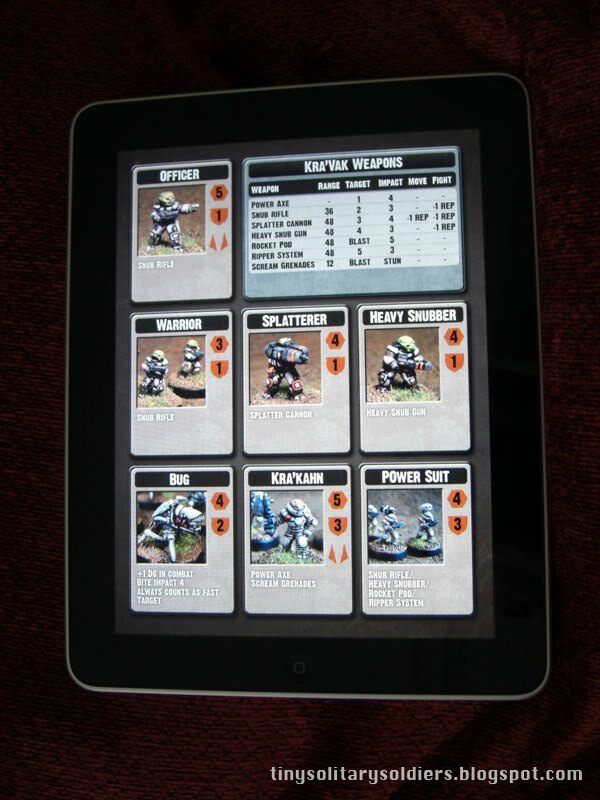 As the rules don't cover very much in the way of creatures and weapons beyond basic 20th century human vs human combat (the full price versions of THW games contain this sort of content), it is up to the user to make up a lot of in-game stats for things. The cool thing is that the stats are so simple that it doesn't take very long, plus there are no points systems so you don't have to worry about balancing. Having all this set out on Quick Referee Sheets rather than trying to remember it all, makes a solo game more fun because you can concentrate on the action instead remembering things. 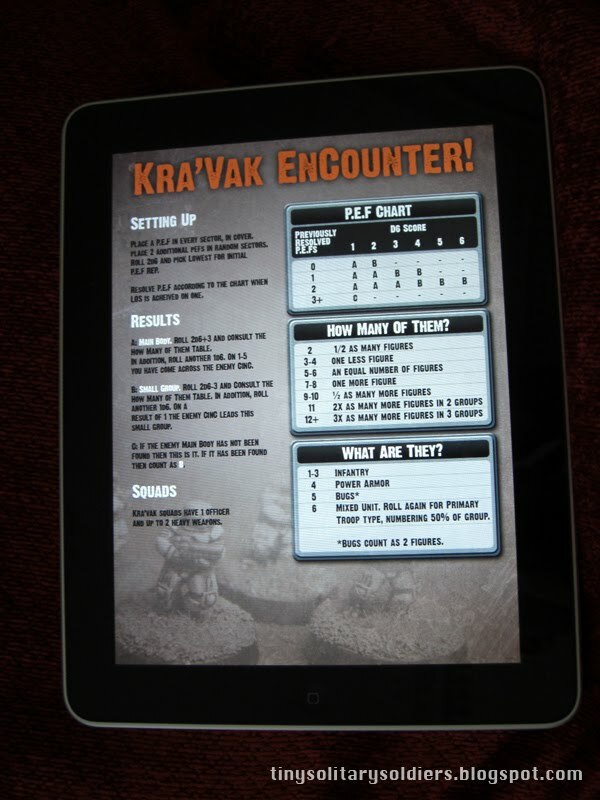 So I whipped up some weapons and special rules for aliens, decided to use the expanded armour rules from the THW yahoo group, and slightly modified the encounter procedure for my Kra'vak figures. I also came up with a simple campaign advancement system which gives the unit some collective values to keep track of things like supply and tactical intelligence without getting bogged down in record keeping. I made some nice looking graphics for all this and used photos to ID the figures (Meaning no need to mark the miniatures in any way) then put all this stuff onto 1024x768 132dpi JPEG images and loaded them onto my iPad. 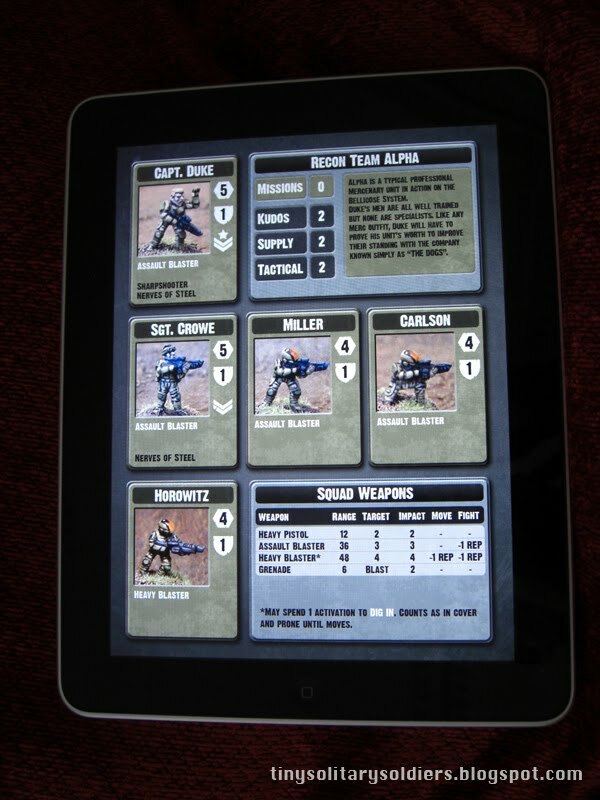 Now I can flick between squad, enemy and reference charts easily and without taking up much space. I am planning on making all of my modified and vanilla CR3.0 charts into images like this, so I can have all my QRS sheets in one place and looking nice. So, I ran out of Devlan mud. It was bound to happen.. I use it on almost everything, including terrain. In fact I think that's where most of it went. A while ago, I did a lot of reading about"Miracle Dip" made of Future Floor Wax and pigment. After reading it all, I decided that I didn't want to use a wood stain dip, or anything that required spirits or turps to clean up. 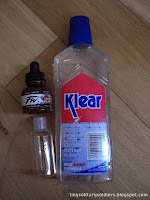 This left the Future Floor Wax, or as it is known in the UK, Klear. 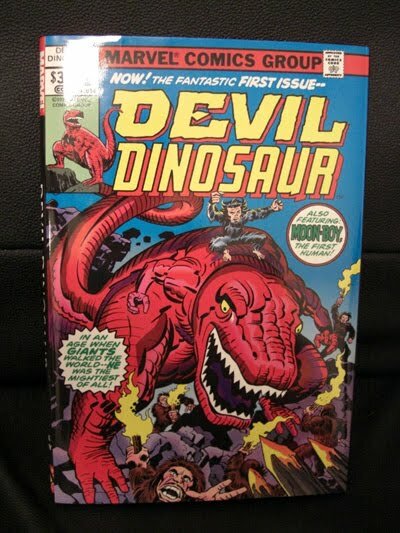 I had to hunt it down on ebay because AFAIK, it's no longer in production. I snagged 2 bottles for a few pounds. At this point it got very confusing.. Lots of people use this home made wash, but nobody ever seemed to post their mixing ratios! It was much thinner and runnier. GW Wash is quite thick, which I think is better because it seems to pool and dry in a better way. It is very glossy. You will need to matt varnish the models if you don't want them to be glossy. 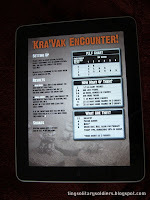 It worked well on the Kra'vak's armour.. But I'm not so sure it would work as well on humans. 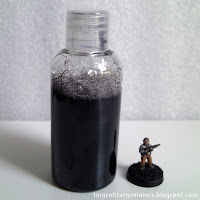 Today's experiment is: "Can I make my own Devlan mud-like wash so I don't have to keep buying tiny bottles at big prices." I expect it will behave slightly differently, but at worst it will probably be good for washing big terrain pieces. 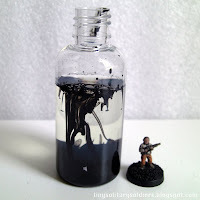 So today I mixed up a batch of 1 dropper full of pure Sepia ink in a small bottle of Klear. 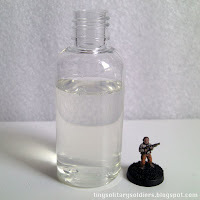 When sloshed around in the bottle it left a similar amount of translucent colour on the sides of the bottle to the GW wash, and it was not possible to see through the bottle when still.. Which is promising. 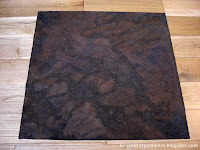 Below is a series of photos I took making some black wash with exactly the same recipe. 1. Mostly fill the bottle with Klear. I figure that if it's too transparent, I can add more ink.. So best to leave some room in the bottle. It looked like this.. Pretty freaky. volume-wise I'd say it was a ratio of 9 parts Klear to 1 part Ink. This is quite different to what I mixed last night.. But I'm hoping that ink behaves differently to paint as a pigment. 3. Put on lid and shake. Looks pretty good.. And if it works that's one giant, cheap bottle of wash. Fingers crossed. The reason I say "fingers crossed" is that I have not tried it yet. I plan to do some painting tomorrow and will find out then. GULP. Ok, so I tried it out. Initially.. Too thin. I added 2 more full droppers of sepia ink and now it's good. It's thinner than the GW product and behaves a little differently, but is excellent for washing figures in a slightly more 'old school' way without the ugly surface pooling. I think I will use it slightly differently, but still very useful. And I won't feel bad slopping it all over terrain.. Plenty more where this came from! These guys were a breeze to paint. Sticking with the Denheb Stone/orange details paint scheme to tie them to the other Kra'vak made this simple. The models took the wash very well and I only had to highlight the large round areas to get a good look. 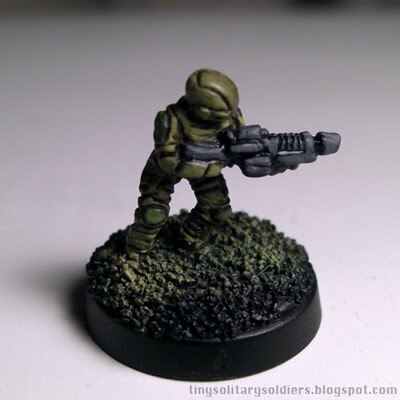 For variety, I snipped off the missile pod from one of the models and fixed on a Garn heavy weapon with a blob of greenstuff and some superglue. I'm treating it as a minigun. The eyes were very difficult, but they came out ok, and I'm glad I made the effort now, as they are quite visible in the photos. All my Kra'vak hang nicely together and are unmistakable at distance from the rest of my collection, which is a win. Next: I think it's time to take a break from figures for a while and start showing how I'm doing terrain. The Garn are big, mean models. 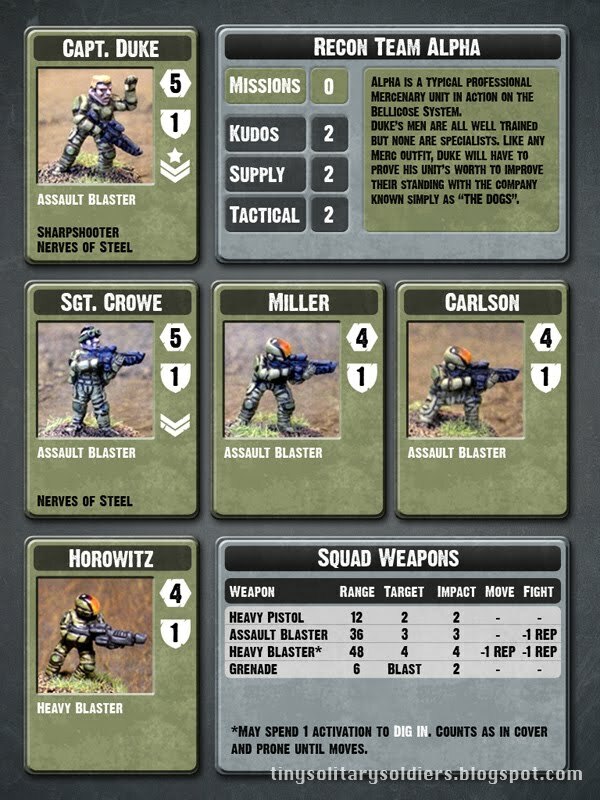 They have separate weapons on little sprues, which will come in handy when I start converting the 2nd squad I bought. I'd love an expansion to the range, hint hint. I was torn between using the brown tones of the example figures on the website, or coming up with something else. Green was right out.. I already have way too many green figures. Then I realized it was a no-brainer. Devil Dinosaur is my favorite Jack Kirby comic. It is incredibly stupid and sometimes makes almost so sense.. But it's awesome. Every story is about "moon boy" getting into a scrape and Devil stomping everything into dust. Sometimes it's cave men, sometimes it's aliens, and in one case it's actually Godzilla. Not joking. An example of how ludicrous it gets is the reason Devil is red.. He went near a volcano. That's it. Seriously. But I digress. This Garn unit will make excellent mercenaries. With my others, I want to split them between adventurer crew ("I'll see your wookie and raise you a freakin' T-rex, fool.") and maybe mixed in with a squad made of CMG aliens. Like an Alien.. Legion. 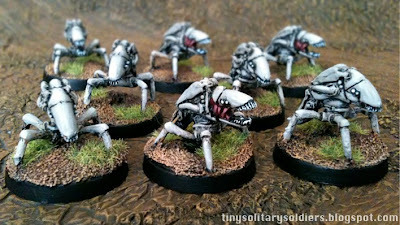 Inspired by the idea of pairing these guys up with my Parasachnids, I tore into these GZG Kra'vak. I wanted to tie them visually to the bugs, so I painted their armour the same colour, GW Denheb Stone. After a lot of frowning, I decided on a bright lurid green skin tone. 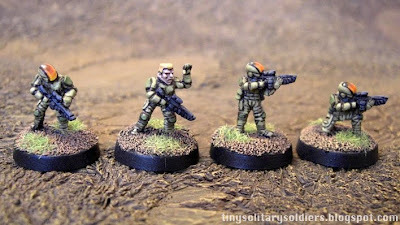 Orange was a close second, so I used that to detail the specialist troops. The models looked a bit plain until I started drybrushing on the base colour. 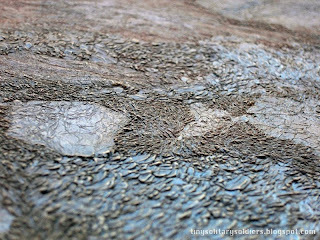 They are in fact extremely rich in surface detail. 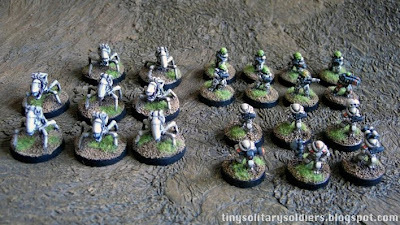 As a bonus, I found a pack of Kra'vak powered armour troops while digging these out of the figure drawer. Infantry, bugs and power armour should prove a fun mix of troops to fight against and I'm looking forward to fielding them. 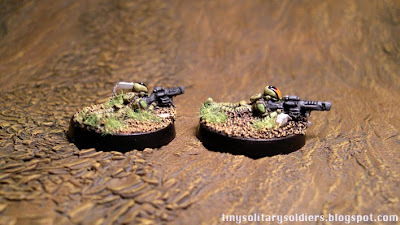 Just like the OUDF, I liked painting these models so much I will probably get some more. The mounted ones riding into battle alongside giant bugs suddenly seems like a brilliant idea.. 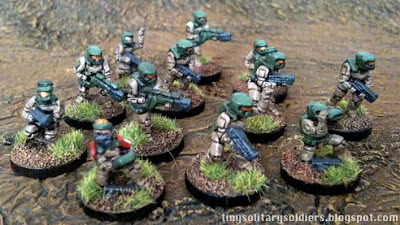 This is how I painted my GZG UNSC Light infantry. 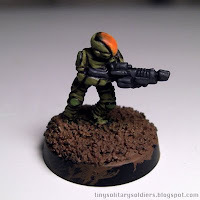 I have listed the exact colours I used, which are GW paints and some Vallejo Model colour. 1. Superglue the figure to the base, fill gaps with putty, cover base with PVA glue, dip in sand and allow to dry. The paint a layer of diluted PVA on top of the sand to seal it. Undercoat with black spray primer. I used a can of the GW stuff. 2. drybrush with VMC Panzer series Middlestone. Make sure you leave plenty of black in the crevices. These figures have a lot of folds and small detail that will work well if they stay dark. Hand paint in any areas that look blotchy on the top surfaces. Then paint in the gun (GW Adeptus Battle grey) and knee/shouderpads/pouches with GW Catachan green. 3. Wash the main body with GW Devlan Mud, and the gun with GW Badab Black. 4. When dry, paint in a highlight of the original base colour on all areas. If you keep the paint quite thin it won't matter if you get a bit messy, as the thinner paint will allow the deep shadow to show through. 5. Paint the visor black and do a second round of touching up the highlights with the base colours again. If you used thin paint it will probably dry a little darker than you want, so a a little extra will lighten it up. 6. Paint in highlights using VMC Panzer series Middlestone mixed with some GW Skull white. They can be very small, but will give extra dimension to the figure. Highlight all the green bits with a 50/50 mix of Catachan Green and VMC Lime Green. Paint the base with GW Calthan Brown. Blend the visor from red through orange to a tiny yellow highlight at the bottom. It can be a fairly harsh blend as long as you keep the lines thin and tidy. 7. Wash the base with black or dark brown. Tidy up highlights on the gun. I had blended the orange up too far on the visor, so I just painted in a dark shadow on top before painting in a tiny white dot at the top. When I did the rest of the squad I found it easier to do it this way than the "proper" blending I did on the earlier batch. 8. Drybrush the base with VMC Light brown and then GW Iyanden Darksun. Paint some PVA on the worst looking bits of the base and then sprinkle on static grass. Paint a layer of Future Floor Wax/Kleer on the visor. Or use Glossy Varnish. This helps smooth it out as well as make it look shiny. You will need to do this again if you Matt-varnish the model.. Which I always do. Only one head swap this time, the cigar-chompin' squad leader. He's already a firm favorite. The standing SAW Gunner looks a bit too much like the other troops, so I may add more colour to the gun. I recharged my camera, figured out the Macro function (half-hold the button to focus.. duhhh.) and used my normal tripod. The newer pictures (UNSC and Zuzzy mat) look much better to me so I'm going to stick with this method and leave the iPhone to mind it's business and not muscle in on real camera work. 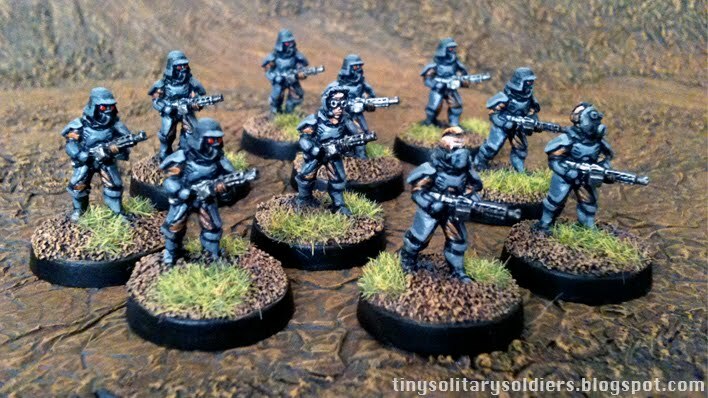 My most recent batch of models were the "Player Forces" I'd been saving until I had enough painted "bad guys". This was deliberate, and to make sure I didn't cave in and use unpainted metal as opponents. I hate unpainted metal. These figures literally have it all. Great posing and lots of variation, plenty of detail that takes paint well, great looking weapons, not too big, not too small. The UNSC Light Infantry are one of GZG's newer ranges and are absolutely spectacular. 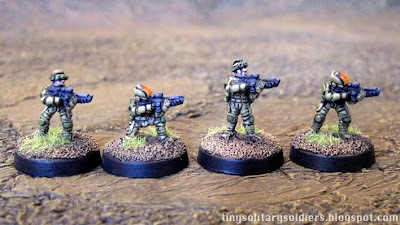 I actually painted some of these back when I did the NI troops as an Elite force. I did them light grey with dark grey detail, and bright yellow visors. I was inspired by the cover of the sadly mediocre PS3 game, "Haze". It looked terrible. The "old method" greys looked completely indistinct, and the weapons were plain and hard to see. So I stripped them in acetone nail polish remover (Boots, 99p) and tried again. Pulling them off the old MDF bases and stripping them was in fact, extremely fiddly and difficult. I don't think I'll bother with it in future. 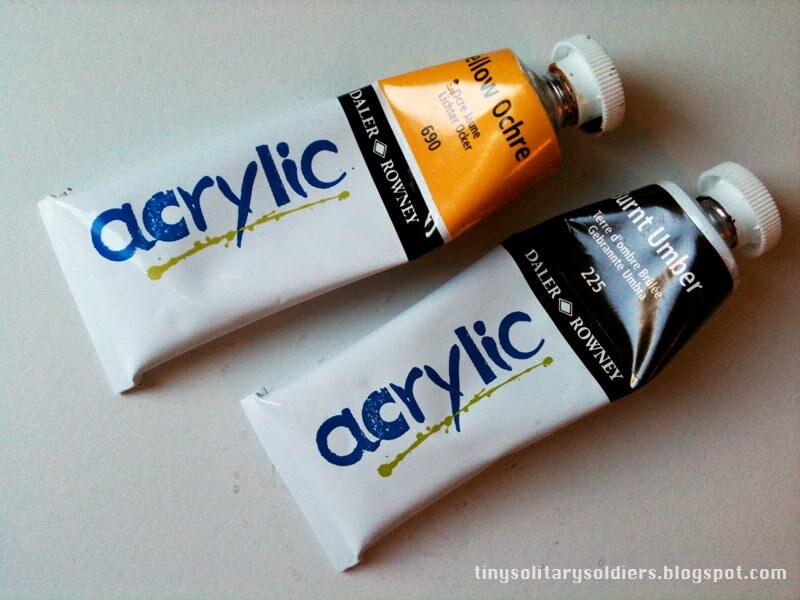 I have more to do, so rather than explain the painting process here, I will make a tutorial and explain as I go in another post. I did spend a little longer on these than earlier figures, but they were still not especially difficult. I am very pleased with how the paintwork came out. The excellent detail all shone through and the oldest trick in the book, painting the visors like "Jewels" looks great at 15mm. The head-swaps worked a charm as well. The sprues (also from GZG) are much closer in scale to these figures than some others so they don't look too big. Interestingly, when buying online I've often been worried or put off by big heads on 15mm models, but they usually look much better IRL than in a close-up. At gaming distance, they look perfect.. I guess it's one of those scale illusion things. Tom from the Miniaturereview.com asked me what my backdrop was for the photos I've been posting. 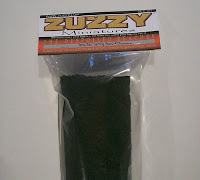 The answer is a latex "terra-flex" mat from zuzzy.com. 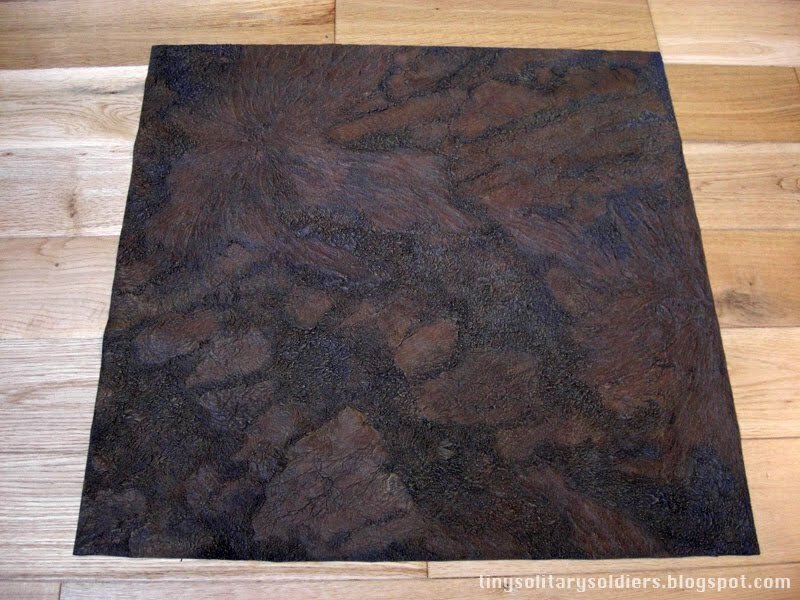 I chose the 2x2 sulfur fields gaming mat, for a very reasonable $15.97 plus shipping. The mat made it over to the UK quickly and packed in a sturdy box. The mat is unpainted latex rubber, and is grey in colour. I painted mine using inexpensive artist's acrylics from the art supply shop. I first painted the whole mat with diluted Burnt Umber. It took a while, but wasn't difficult. 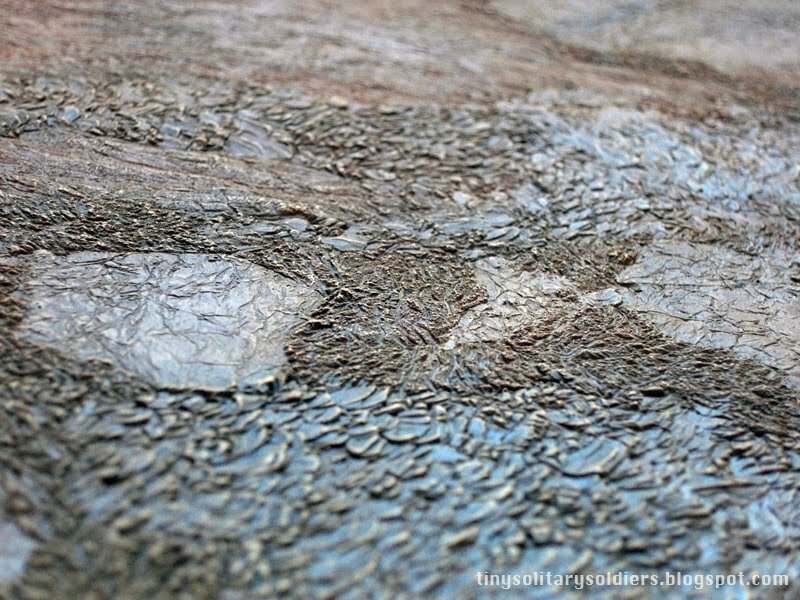 The website has a good tutorial, which explains drybrushing and scumbling techniques. The key is to keep the layers as thin as possible to reduce the risk of cracking when rolling up the mat. After that I did a thinned down black paint wash, before allowing to dry and beginning drybrushing with mixes of burnt umber and yellow ochre. A few times some areas became too bright and I had to wash them back with black or black-brown mixes of heavily diluted paint. It worked though. Doing the final highlights, I mixed in some regular citadel paint for final highlights.. Probably just skull white or buff.. I don't exactly remember. Because of using thin coats of paint (and relatively thin paint itself) you have to do LOTS of passes. I was watching TV while mindlessly brushing away, thinking it would not take long, but I got through a few episodes and was only halfway done. It was a couple hours work to get it right. Figure protection. The surface is rubber! Laying a figure on it's face or knocking it over is relatively stress-free. A huge plus in my book. Rolls up for storage. 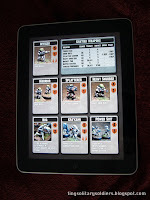 This is much better than a solid battle-board for my uses. It is thin and weighs next to nothing. Excellent. Because you paint it yourself, it will definitely match your basing finish. You have to paint it yourself. Personally I prefer this anyway. I was considering getting 4 of the GW plastic battle boards, or a bunch of big Kallistra hexes (and for a while, using Heroscape tiles) but in the end the Zuzzy was the best option for me. Compared to flocked boards, cloth boards, textured painted boards or no board.. The Zuzzy mat beats them all hands-down for looks, value for money, storage and portability. These models by Khurasan were bigger than I expected. 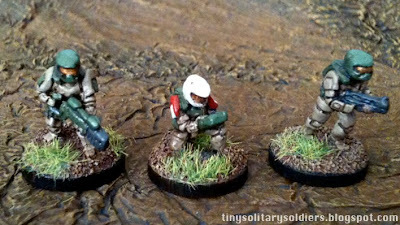 I had to order in some 25mm bases for them, and even then spent some time bending the legs in a bit to fit. (and I realize just now that because I haven't put anther figure in the shot for reference, I am perpetuating the issue. Oh well..) Not that the size is a problem though, they will make terrifying opponents for human sized models! Stupid anecdote: While trying to assemble them (They come in 2 parts) I was annoyed by how long the superglue was taking to dry. I thought it must be because of the joins not being particularly flush. So to remedy this I made a quick batch of milliput and squished a tiny ball of it into each leg section and then mushed the top back on, into the putty and glue. The fact that the glue was still liquid after 15 minutes should have set off an alarm bell. But I was thinking about other things. It was not until the next day when attempting head swaps that kept falling off, that I realized I had mixed up my bottles and been using PLASTIC GLUE. Doh, to say the least. Turns out that yellow milliput and plastic glue do in fact combine into a mighty bonding agent, so it was OK in the end. 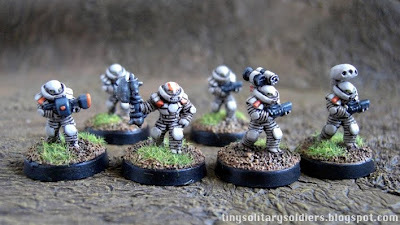 I painted these very simply while waiting for my Titan Marines to dry. Slopped on Dheneb stone over the black undercoat, then drybrushed in a highlight and painted some final highlights (white mixed into the Dheneb stone) to smooth out the finish, as I hate the look of speckley drybrushing. I picked out the mouth detail with some red highlighting, and wished that more of them had open mouhts, as it adds a nice bit of interest. They were very very fast because of this.. The painting certainly took an insignificant period of time compared to the assembly and basing, the latter requiring a lot of putty. They look a little better on the table than in the photos, but in retrospect I think I rushed them a bit and didn't respect them enough. I really should have taken more time with them, as they are brilliant models. The piant jobs on the Khurasan website are a lot better than mine. I think I'll pair them up with my Kra-vak when I paint them. The Kra-vak are great models, but a little small by today's standards. The idea of little alien soldiers with huge attack bugs makes me smile. So far I've been taking photos using my iPhone 3Gs. This wasn't my first choice, I tried using the macro function on my exilim digital camera, but it didnt macro very much and then promptly ran out of batteries. The iPhone 3gs has a pretty good autofocus, although it seems to be good at taking enormous but slightly grainy pictures. I think this is from me holding it in my hand instead of using a tripod.. Or it might just be that it's a sh*tty camera phone and not suited to taking photos of tiny little models. It's extremely easy to get the photos onto my computer or iPad though compared to faffing around with an SD card with the camera. I ordered a gorillapod flexible tripod from Amazon.. Then realized I could probably build a decent stand out of Lego for what I intend to use it for. Doesn't matter, I'll see how I go with a simple Lego cradle. I have a hunch (could be totally wrong) that the iPhone software is doing some kind of face recognition as well. It hunts aorund quite a bit when first pointed at a group of models. I may have better results if I start photographing them in single rows instead of clumps. Oh well, end of Friday.. I'm off to the beach for a drink. 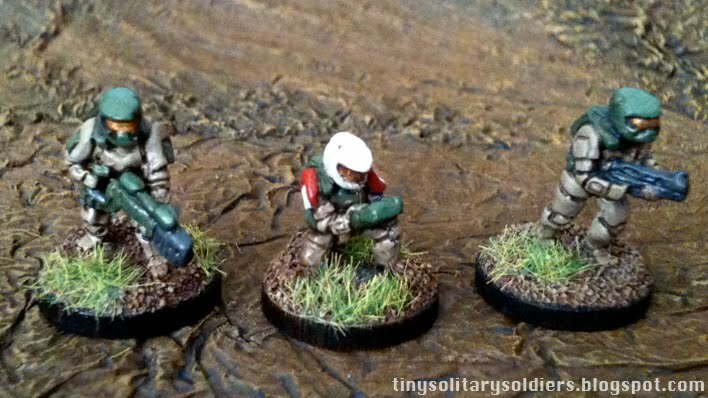 I ordered these models by guesswork based on the "kneeling and prone" photo on the GZG website, and I lucked out. I love these slightly stumpy little guys! They are great looking troopers with obvious science-fictiony helmets and a nice amount of chunky detail like packs and pouches. I don't know why exactly, but they look to me like they are slightly scared or confused. Brilliant! They have grown on me so much I will probably get some more and do some conversions. The one small issue I have with them is that some of their guns are a bit "bendy" looking. Once painted a dark colour though, it's not noticeable. I used black wash on these guys before highlighting up, then a sepia wash on the pouches and flesh after the green fatigues were dry. I was originally going to give them a very simple colour scheme that was basically all green, but eventually settled on black armoured vests to break it up. Another very easy and fun set of models to paint from the excellent Ground Zero Games. Local manufacturers The Scene make some really cool models. I ordered a bunch of stuff at very reasonable prices (Can you buy a top of the line 28mm character model for 40p? No.) and super fast shipping. First off the block were these battle robots. 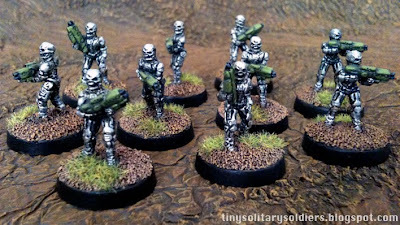 I was drawn to these because they didn't look precisely like Terminator robots or Necrons, though of course evocative of both to an extent. For a while I thought of using the larger robots as support for human forces and painting them like tanks or the ABC warriors, but decided that adding some varied troops types to the battle robots would be more useful. I did chop down their noses at 45 degree angles to make their faces more skull-like and match their little brothers. These were incredibly easy to paint, 2 stage metal drybrush and black wash. I used some Gryphonne sepia in random patches to add some subtle variation to the finish, which isn't very evident in the photos, but does an admirable job. The guns were a little trickier, but I wanted to make sure they were nice and distinct from the robot bodies. Luckily they have tons of detail and looked great with some simple highlighting. I'm not a fan of painting guns like they are made of silver most of the time anyway, but in this case they would have just plain vanished. The guns ended up being my favorite bit of the finished models. I think I will round out these forces with some of the remote gun platforms from GZG eventually. As I'd only ordered 7 zombies, I thought I'd wait until my next order from Khurasan to finish off enough to game with. So in the spirit of getting lots of "bad guys" done before starting off the heroic forces I got stuck into a batch of Rebel Minis Titan Marines. 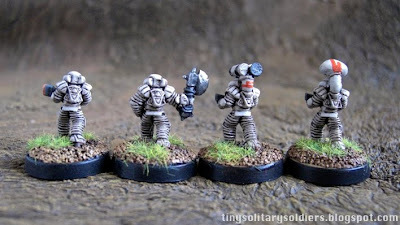 Although they look extremely reminiscent of the Jin-Roh anime, they are enough like Helghast that I decided they would make fine space-fascists. This meant Hollywood grey uniforms. Grey and black are tricky at 15mm. Not because they are hard to acheive, but because they look terrible at distance. To my mind this means you have to highlight the bejeezus out of them and make sure there are areas of another colour to break it up. 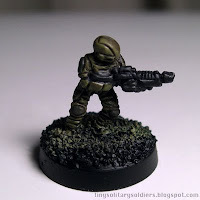 In this case I gave them high contrast brown fatigues under the armour plates, red eyes and metal guns. Several heavy black washes took care of the shading and brought out the detail. The masks were done the same colour as the armour but I hit them with 2 extra layers of black wash to make them more visible. Also of note with these figures are some head-swaps using the excellent sprues from GZG. I used a pair of nippers that very nicely took the heads off at the armour join. The scale is spot-on and it's particularly nice to have some extra variation in this group, as the models are quite similar in pose. I still have a half bag of these left, and am thinking of swapping all the heads on them to make a different troop type. 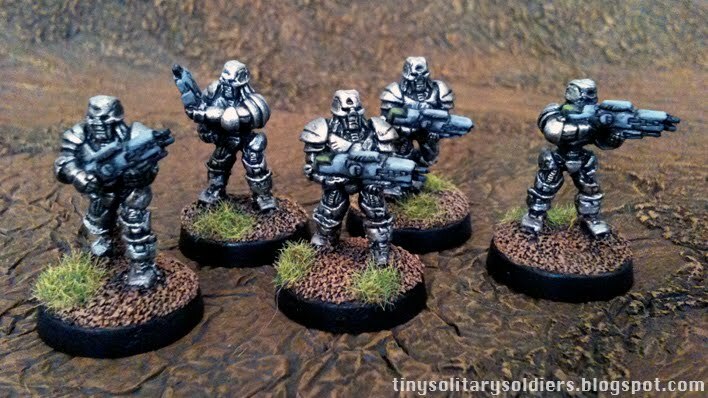 These guys look great on the table and were a pleasure to paint. Because of the limited palette they were also very fast to complete. There's no point rushing. 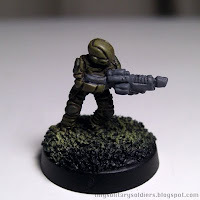 I'm never going to be happy with fast paint jobs, so use proper technique. The smaller the miniature, the higher contrast the paintwork needs to be. Fine blending is next to useless on the table, so use much bigger jumps in shading colours than normal. (In fact "If it looks like it's going to be too harsh, it's probably right") became a good rule of thumb. Washes work much better at this scale than larger ones (at least how I used to do them) and are incredibly useful for showing detail. 20mm plastic bases (from em4 miniatures.com) are a much better size for both handling and appearance. 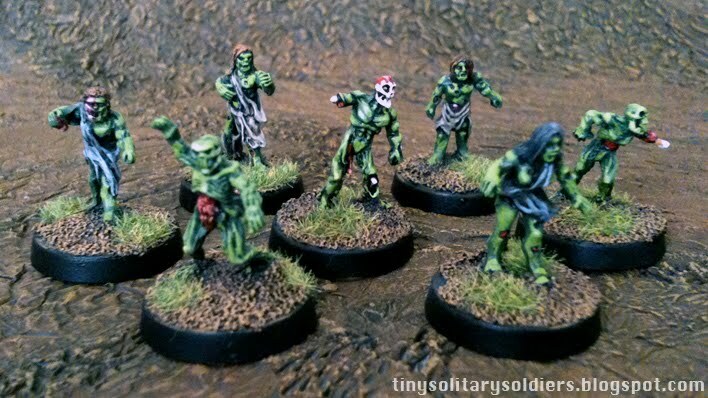 And so I began with the excellent khurasan miniatures zombies. These models are packed with detail and I liked the skull-faced nature of them. Lots of other zombie ranges could be painted as regular citizens and you wouldn't know they were the walking dead. Plus these ones have no obvious period clothing, so will work well in sci-fi and weird war 2 games. Clean and glue to 20mm base, PVA on some sand. Tidy up green areas with small brush and slightly thinned down original green colour. You will see there is nothing remotely clever here, it's all very bog standard "how to paint a miniature" stuff. The approach is the interesting part. Interestingly, the "old" technique looks pretty good in photos and the "new" one looks less sophisticated.. But maybe that's exactly the point. This "harsher" way of painting them (and also using unrealistically bright colours) makes them look much, much better on the tabletop. Painted like this, I can see the nice detail at distance rather than a brown blob. I used the same basic technique as described in my last post. The only difference was I did an additional black wash over the weapons. Overall, The results were even worse. I had used a yellowy brown for the base tone, which when using a dark brown wash, ended up way too dark.. Or at least not what I was expecting. 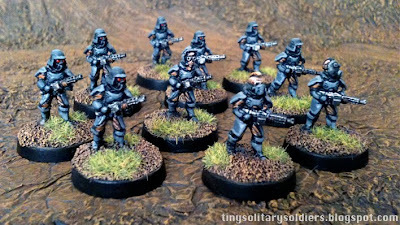 The Leaders and special weapons models were also very difficult to tell apart from the regular troops. A new approach was clearly required. On the plus side, I had fully painted about 30 models easily in 2 short evening sessions.. Something absolutely unrealistic when I used to paint 28mm. The speed of completeion was a lot of fun, even if the results were not what I wanted. I took a break after this initial burst of activity and had a think. 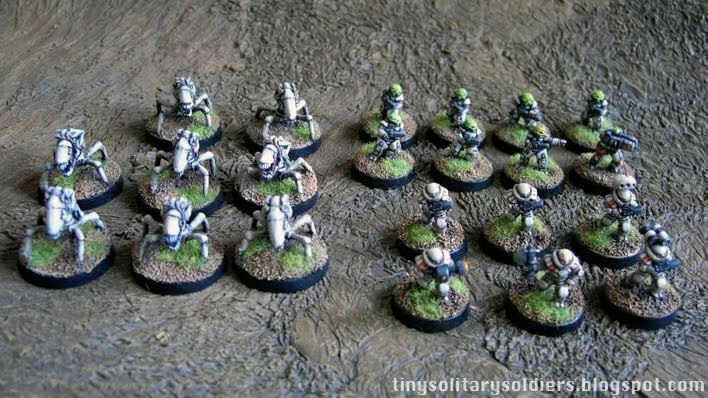 The first models I picked up were a bunch of Ground Zero Games NI infantry and some of the "Crusties" aliens. I decided to do the WW2 U.S colours so I could use them for retro-sci-fi forces against future space-facists. The Crusties would be done something like the D9 Prawns. At this stage, I wanted to finish them very quickly and was intrigued by using "Magic Dip" technique.. Which for some reason seemed ideal for 15mm to me. This was based on an attempt to paint a NI infantry model traditionally as I would have done a 28mm, and finding it fiddly and too time consuming for the final result. 1 coat of Devlan Mud Wash with a little bit of Future Wax over entire model and base. Allow to dry, then slop a little bit more wash into recesses where it looked too light. 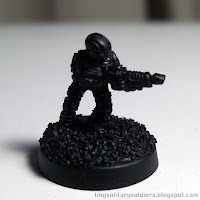 Drybrush base, paint edge black, glue on static grass. Varnish with Dullcote. 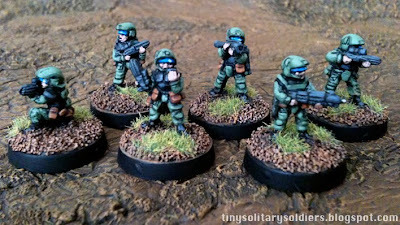 Also, I had wanted them to look like little 28mm figures so based them on 18mm MDF discs from Warbases.com. They looked nice, but were a bit fiddly. 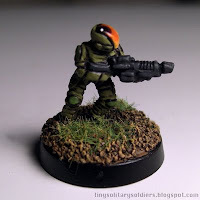 I have recently got back into the miniatures hobby after a very long time away.. At least 10 years I think. 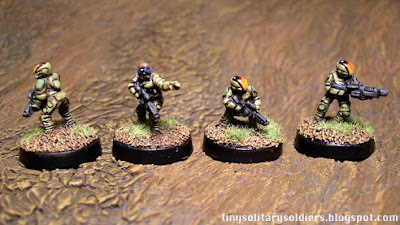 I was primarily a 28mm/GW gamer/painter and spent countless enjoyable hours with my friends painting and playing games. 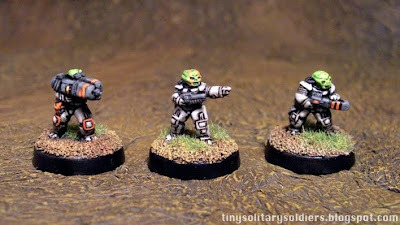 This blog is about my return to the hobby in what I hope will be a limited and therefore more productive way. My main goal is just to relax painting cool models. Why 15mm? Because there has been a sudden explosion of ranges from various manufacturers in the last year, of tremendous quality. Price-wise, they are cheaper than the paints I'm using and are exremely good value for money. More importantly, they are much easier to store.. And of course this means that scenery is easier to build and store, and doesn't require a huge play area. 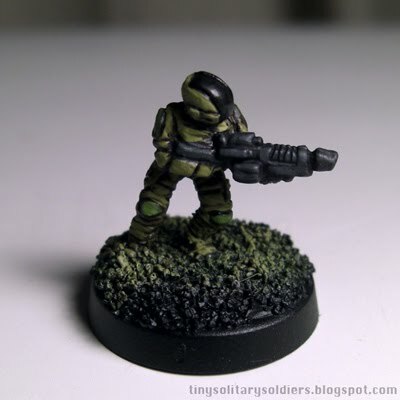 I thought I'd share my experiences of dusting off my ancient painting skills and seeing how they translated to 15mm figures.